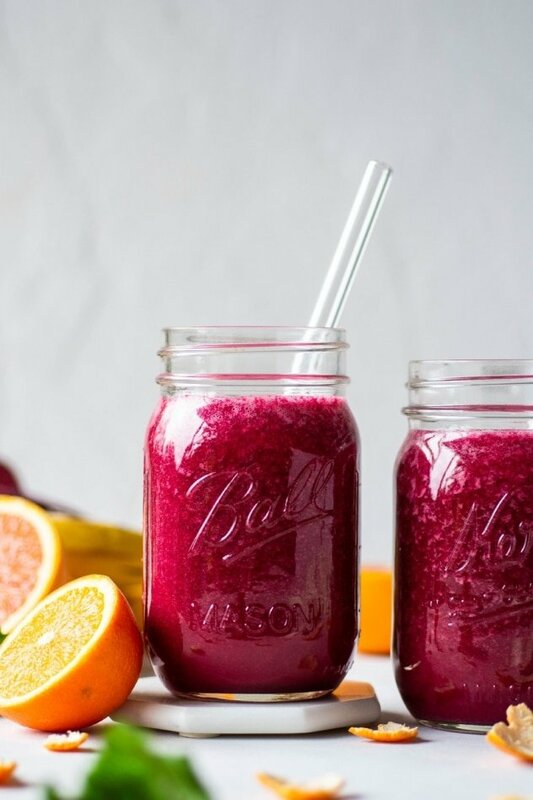 This beet and berry smoothie is made with 5 healthy & vibrant ingredients that will make you glow from the inside out. Vegan, paleo friendly, and whole30 compliant – it’s a crazy delicious way to start your day with a healthy dose of both fruit and veggies! 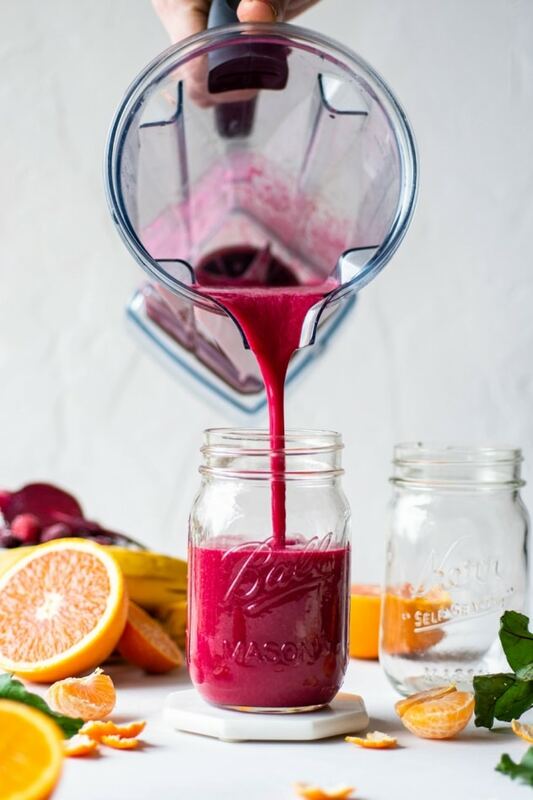 Umm HII snowy-slushy-cold-grey February in Seattle – I think you need a glowing glass of this vibrant beet and berry smoothie. Featuring all the good things to make you feel alive inside – beets, berries, whole citrus fruit, bananas and H20 baby. Because hydration makes the rockin’ world go round. And also makes our bodies very very happy. This entry was posted in breakfast, drinks and tagged banana, beets, berries, blender, citrus, easy, healthy, orange, paleo, quick, smoothie, vegan, whole30 on February 14, 2019 by Nyssa Tanner. 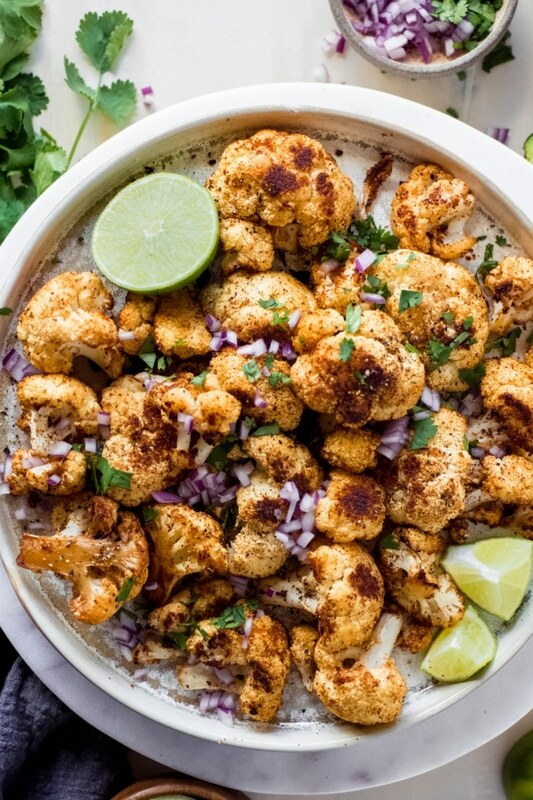 Mexican roasted cauliflower might just become your new favorite veggie side dish. 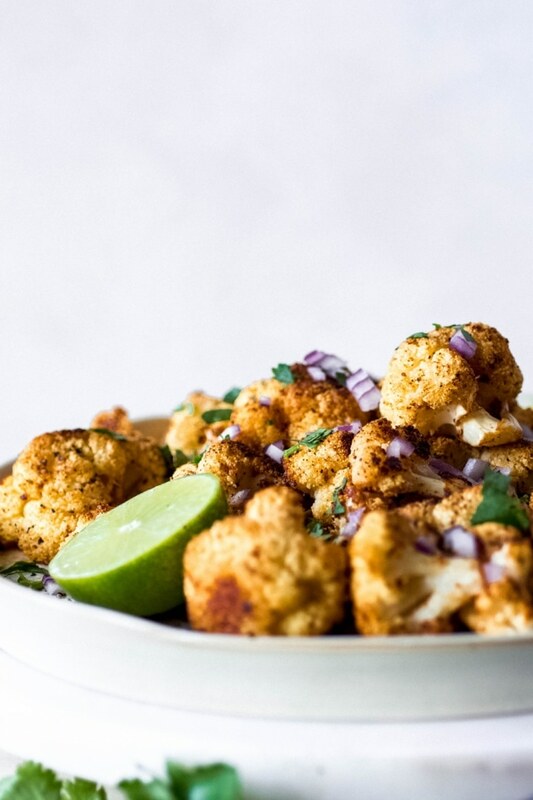 Cauliflower florets tossed with some flavorful spices and roasted until crispy and caramelized, served with a healthy squeeze of lime juice, cilantro, red onion, and maybe even some avocado for good measure. Gluten free, paleo, vegan, AND whole30 friendly! I don’t know about you guys, but if you’re anything like me, you go crazy for just about any roasted vegetable. And roasted cauliflower has always been on the top of my list. There’s something about the way it gets all crispy, tender, sweet, and salty at the same time that makes it straight up IRRESISTIBLE to dig into. When roasting cauliflower I usually go for the classic combo of avocado oil with salt and pepper, just because it’s easy and also totally freaking delicious. I have definitely been known to roast and devour a whole head of cauliflower solo style, but sometimes dinner deserves to be made a little more special by stepping the flavor up a notch (or two!). This mexican roasted cauliflower does exactly that. By adding just a few little extra spices and garnishes you take a side dish that is already pretty much the best thing ever to the next level of DELICIOUS. This entry was posted in side dishes and tagged cauliflower, easy, gluten free, grain free, paleo, quick, roasted, side dish, vegan, whole30 on February 10, 2019 by Nyssa Tanner. 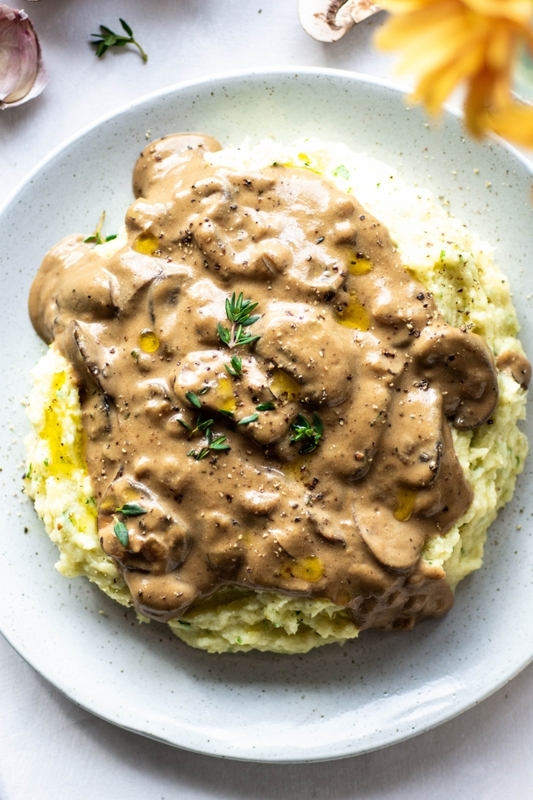 This gluten free and vegan mushroom gravy is the stuff that dreams are made of. Creamy, rich and flavorful, without any gluten or dairy. Make ahead friendly and an easy, healthy recipe that’s perfect for the holidays! Gluten free, paleo, vegan and whole30 approved – a crazy delicious gravy for everyone at your table. This dish, like a lot of the comfort food recipes I share here on NK, reminds me so much of my grandma. She was a 4’11” queen of the kitchen – particularly when it came to comfort foods like a delicious gravy, a tender roast, or a warm and filling stew. She was my first teacher in the kitchen – patient, kind and oh-so-good at making food taste freaking delicious. 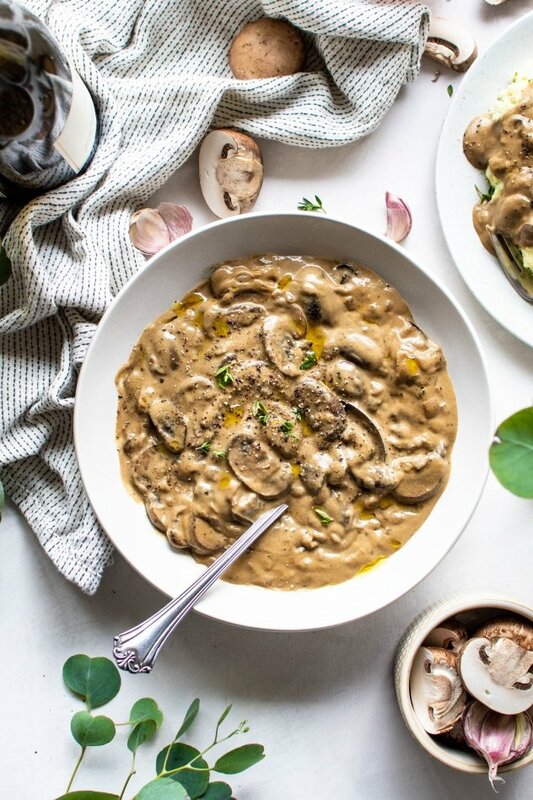 I’ve taken her mastery of depth of flavor and used it to create a recipe for a healthier, gluten free, vegan, paleo and whole30 approved mushroom gravy that will make you feel all the comfort food feels. This entry was posted in dressings & sauces and tagged christmas, easy, gluten free, gravy, holidays, keto, low carb, mushrooms, paleo, thanksgiving, vegan, whole30 on November 13, 2018 by Nyssa Tanner. hi & welcome to my kitchen! my name is nyssa (pronounced neesa), and this is my place to share with you the food that makes me feel good to be alive.